Diesel Planet in Shanghai illustrates how fashion fits lifestyle and augments its line with bespoke clothes. Two continents’ worth of urban markets, some just emerging and others long established—with this diversity come fast-evolving, locally nuanced ideas about leisure that are redefining the category. The image of the big Asian and Australian cities is of modernity writ large. But consider Singapore: after a period of rampant modernization, “they realized they were bulldozing their patrimony,” says Gensler’s Michael Wiener. Preserving tradition became a priority. And while Sydney is redeveloping its docklands in modern Canary Wharf style, the historic core of the city still exists, says Simon Trude. To stay competitive, the owners of the older buildings are repositioning them to serve a changing lifestyle. “The competitive edge for the older districts is the way work and leisure are converging,” he says. Office buildings are adding fashion retail and flexible eateries: cafés in the morning and full-on restaurants at night. Bike storage, showers, lockers, gyms, pools, yoga studios, and personal services support the healthy, outdoors-oriented work style and lifestyle that define Sydney. Rising affluence creates consumers who want to be educated by retailers on how to use the products. To cater to travelers from home, local hotel brands are expanding regionally. China’s one-child policy, along with compulsory retirement at a relatively young age, means that a rising cohort of retirees will soon complement the youth market. “With their children moving into white-collar jobs, the ‘young-old’ have increased buying power for leisure,” says Lin Jia. In contrast, 67 percent of Indians are under the age of 30. Mass leisure is big there and films are the heart of it. “The studios make 900 movies a year,” says Smita Gupta. “There’s a cinema for every price point.” PVR Cinemas caters to the upper end of the market with destination theaters. Such is Bollywood’s power that the locations of its films, such as the Alps, become favored destinations for travel-crazy Indians. 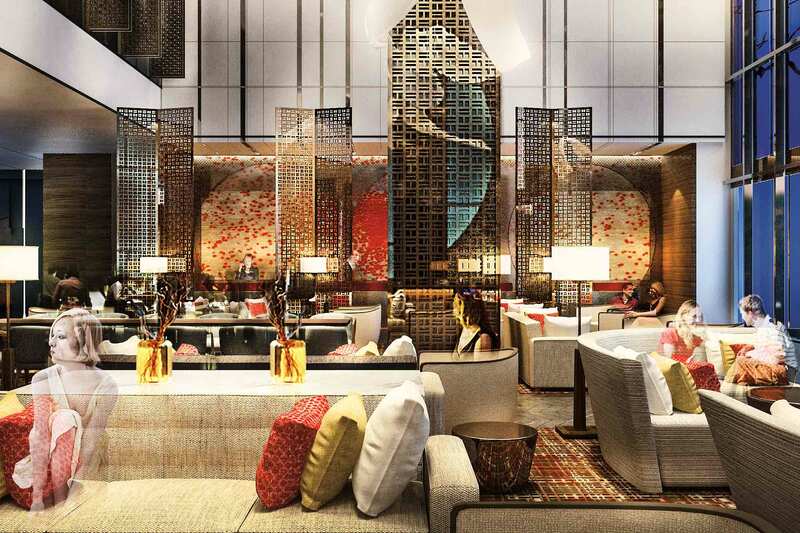 The five-star CATIC hotel in Kunshan will make its lounge and restaurant a prominent lobby feature. 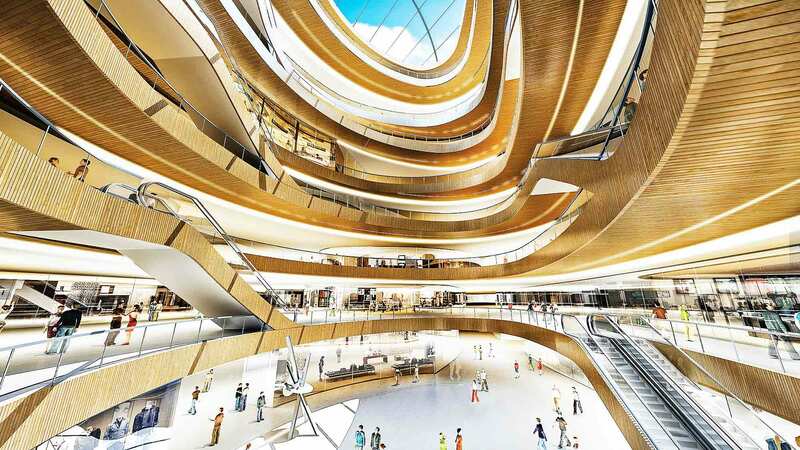 The CP Super Brand Mall in Luoyang, Henan Province, is aimed at China’s prosperous, fast-growing middle class. In India, the scale of social gatherings is even larger. “It’s not unusual for a birthday party for a one-year-old to have 100 or 150 guests,” says Gupta. “It’s expressive of the parents’ position in society and the importance of the extended family—not just siblings and cousins, but work colleagues. Weddings are business-social.” Banquet rooms are a huge source of revenue for the top hotels across Asia. While the format in Korea and Japan is recognizably global, India is complicated by the fact that 40 percent of the population is vegetarian, Gupta notes. “Kitchens have to be separate, so the back of house is correspondingly larger.” It’s the opposite in Myanmar, Wiener says. “A wedding is a more modest affair—a slice of cake and you’re on your way.” So a new Mandalay convention center may have banqueting, but the back of house is scaled way down. Luxury in India is labor-intensive, Kap Malik says—something that international hotel brands don’t always anticipate. “Hotels have an army of servers, and the clientele all have drivers. They need a place to wait, so the top-tier hotels are finally providing that.” In India, Indonesia, and Sri Lanka, leisure caters to regional tourists and nationals visiting from abroad. The five-star ITC hotel and residences in Sri Lanka targets Indians looking for a familiar brand with a “responsible luxury” image. 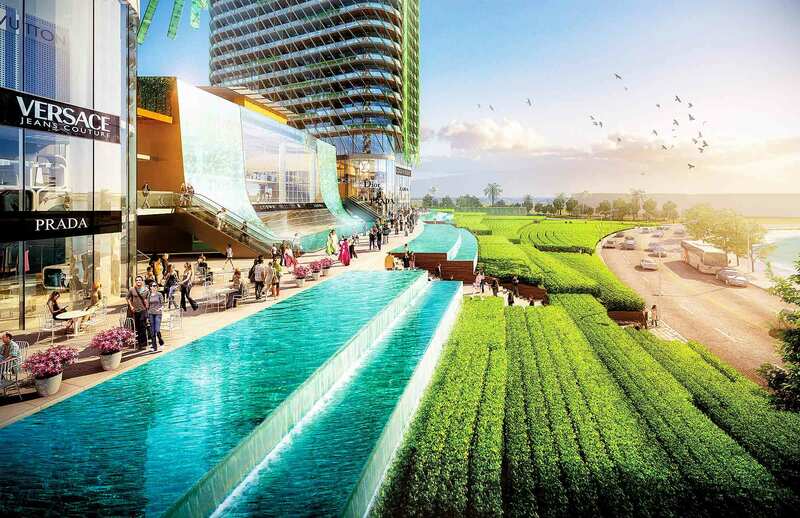 An updated five-star complex in Jakarta appeals to expats home on leave. “High net-worth Indonesians will host the whole family, so a generous apartment paired with a hotel’s worth of facilities and amenities is almost a necessity,” says Wiener. ITC’s Colombo One Hotel brings a leading regional brand to Sri Lanka. China is arguably the world leader in mixed use, and not just at an urban scale. For hospitality and retail, the need to tailor global brands for local consumption was resisted by brands aiming for a signature consistency. “That’s changing,” says Contreras. “Brands see that customizing and localizing help define a unique character.” The trend for hotel restaurants to become hot destinations means that lobbies are inviting locals in. They’re also designed to mutate over the course of the day, catering to a changing clientele. For apparel and home-furnishing brands in China, the most successful are really selling a lifestyle. “Yet everything has to be fine-tuned, city by city, to reflect climate and local preferences,” Chang says. The social matrix figures here, as well, with shopping often becoming a full-family expedition. Creating destinations for family shoppers drives mixed use. They offer something for everyone, readily accessible and all under one climate-controlled roof. Max Brenner Chocolate Bar in the Omotesando Hills retail center adapts a NY favorite to Tokyo tastes. The growing desire for authenticity and a touch of tradition is prompting in-city destinations like Shanghai’s Xin Tian Di and Tian Zi Fang, Amber Sun explains. They repurpose the historic pattern of shop houses and narrow, tree-lined alleys into car-free settings of smaller-scale cafés, restaurants, and boutiques or arts-and-crafts enclaves. In Beijing, freeway-size arterials and full-block buildings are problematic for leisure. “Making room for it is a challenge,” says Emma Chang. Gensler is designing a walkable creekside “village” at the city edge and resorts close enough for short getaways. “There’s a desire for leisure with a human scale and a sense of nature,” she says. Despite heavy traffic, people will seek them out. Asian leisure draws on the past without taking it literally, says Ken Sizemore. Feng shui influences modern Chinese and Thai architecture. 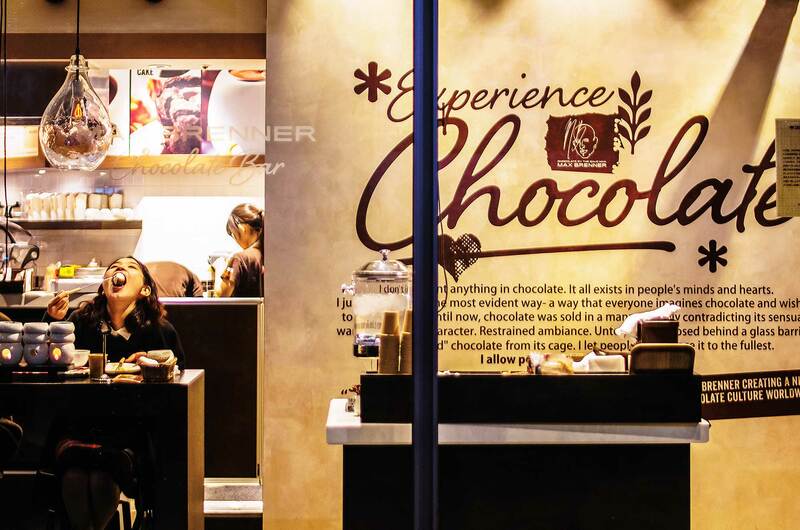 “In Manila, you see modern shopping centers that preserve a traditional indoor-outdoor flow,” adds Wiener. “By heeding the microclimate and using shade and shadow effectively, you can open them up and still be comfortable.” Honoring these nuances, he believes, is how leisure speaks to sense of place across this vast and exceptionally varied region. Sarah Amelar writes for Dwell, Architectural Record, and the New York Times.